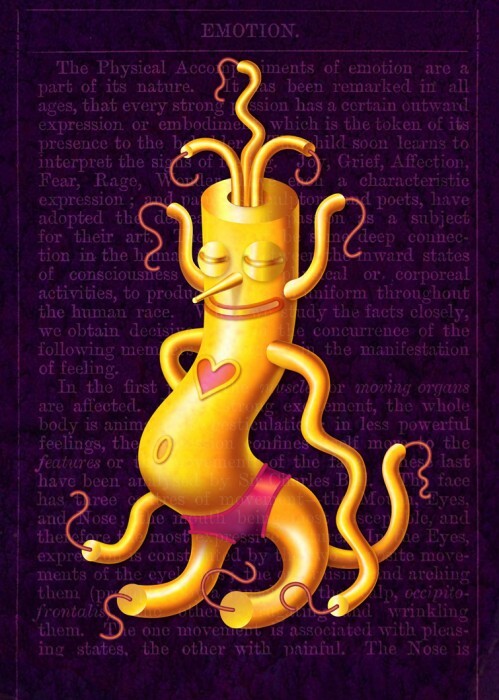 Well, I’m mighty late with my AlphaBot this week, but at least I’m in time to wish you all a blissful Valentine’s Day with Oddment 200! Speaking of programs, I’m using this series to teach myself how to “paint” in Adobe Illustrator. In this piece I made extensive use of the gradient mesh, which partly explains why it’s so late! It’s an amazing tool, but it can drive one a bit nuts, especially as a newbie. And of course I’m still not really satisfied. I hope one shining day to figure out how to make AI gradients tamely do my bidding. For now they definitely still have my knickers (& often my Bézier curves) in a twist. So much for my hope that I’d be as blissful making this bot as I was angstful for the last! This entry was posted in Curiosities, Experiments and tagged Adobe Illustrator, AlphaBots, Artificial Emotional Intelligence, Bliss, Robot, Valentine on 14February 2013 by Leah.